I never get tired of the weather here in southern California. Friday sported blue skies, a light breeze and comfortable temperatures. So I decided to tear the coverings off the outdoor furniture and do some work outdoors. As I settled onto the chaise lounge and fired up my laptop, I thought how incredibly lucky I am to be able to work from home. And the irony was not lost on me that as I sat alone by myself — just little ol’ me, myself and I — I was about to get very, very social. Pinterest, Facebook, Twitter, Email. It was time for me to engage with the online world. And just as I was preparing to send out a tweet, I suddenly noticed…tweets. Even though I’m smack dab in the middle of Hollywood, I was surrounded by bird calls, including the unmistakable cawing of my neighbor’s parrot. I realized I could read tweets and send tweets in some social media cyberspace or I could actually LISTEN to tweets in the here and now. So I closed my laptop, closed my eyes and meditated for a spell, tuning in to the social conversation of the feathered friends who share my neighborhood. As we become more and more dependent on technology, it’s easy for us to become more and more distant from nature. And that’s a very dangerous thing for our planet. When we humans forget that we’re part of a natural world that exists independent of 3G or WiFi, it’s that much easier to break a hometown watering ban, buy another gas-guzzling SUV, leave electronics plugged in during two-week vacations and support fracking and drilling even if they destroy important eco-systems. So what about you? Are you paying more attention to tweets on Twitter than the tweets in your own backyard? 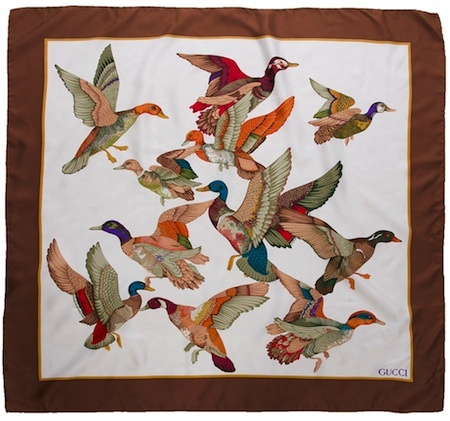 If so, grab today’s vintage Gucci bird scarf and do a little bird-watching and bird-listening of your own. It’s a fine way to engage with nature for a Vintage Crusader.